The holiday hustle and bustle is right around the corner. For those of us with kiddos, thinking about the travel plans to see family and friends can leave us with mixed feelings. On one hand, we’re excited to see our loved ones and look forward to celebrating! On the other hand, traveling with a kiddo can be stressful. Whether it be a road trip or a cross-country flight, being on the move with a baby or toddler can be tough, but not with the right tools. Here’s a list of items that can make being on-the-go with your little one easier. A little bit of prep work goes a long way when it comes to entertainment, no matter your child’s age. Even though it may cost a bit extra, investing in some brand-new entertainment items are a sure-fire way to keep your kiddo entertained. A quick trip to the dollar store can give you a ton of options for little cost. Coloring books, puzzles, and games are just a few items you can find for a buck. If you have a long trip ahead of you, consider breaking activities up into small baggies and dispersing them as new stimulation is needed. Music is another great way to keep kids entertained. Prep a playlist for the car or for older kids, consider loading up an old iPhone with some music for them and letting them listen with their headphones. While I hope you don’t have a “desperate” moment during your travels, it may happen. In that case, you need to have your big-ticket entertainment item ready. For us, this is the iPad. We save it until it’s really needed. We’ve made it through some trips without it, but we’ve also had some moments we’ve been so thankful we have it. No matter if you are road tripping or flying, you are going to have a lot of stuff to manage and still only two hands. An easy-to-maneuver stroller that takes up as little space as possible is a must-have. 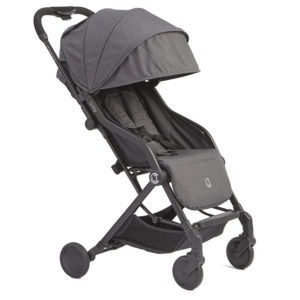 The Contours Bitsy is a perfect example of a compact, lightweight stroller that makes traveling easy. It can easily be collapsed with one hand and fits in most airplane overhead compartments. 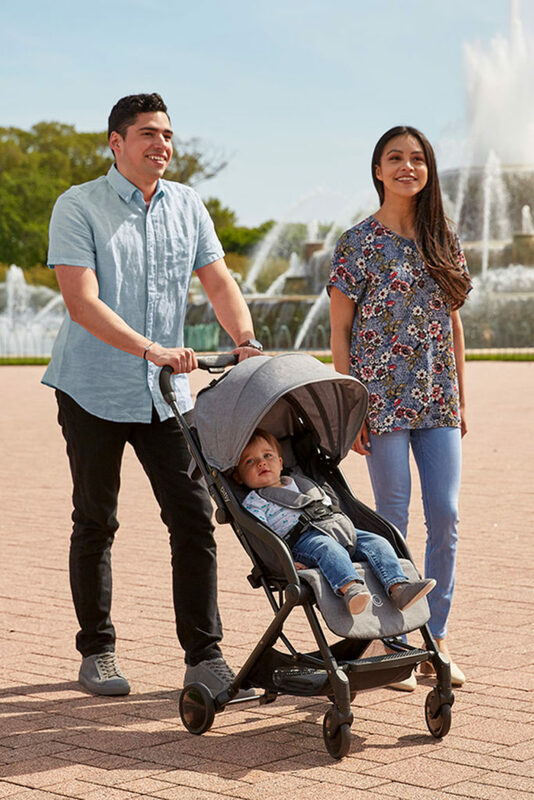 Plus, like most Contours products, the Bitsy stroller is compatible with a long list of infant car seats, so it’s great for travel from birth all the way up to the toddler years. There is nothing that makes a mom feel more prepared than a diaper bag stocked with supplies for any situation that life throws her way. If you are flying, always pack more diapers than you think you may need in case of a delayed flight at any point in the day. Speaking from experience here: I once paid $11.99 for a two pack of diapers and 10 baby wipes at an airport convenience store! So over-packing your diaper bag is definitely worth it! In some traveling situations, a baby carrier may be the best way to go, especially while flying. I’ve made the mistake of intending to hold a sleeping baby on a flight, only to find out that the slightest movement in my very tired arms stirred her awake. Sometimes a baby carrier is a nice break from the stroller and can be a great way for a tired baby to get a good nap. Whenever we travel to grandma’s house, we love having a portable seat for our daughter. We can place it at the table for meal times or on the floor for playtime. The Contours Twist is the perfect portable seat to take along. It can connect to just about any standard chair to turn it into a high chair for baby. It can also be placed on the floor for playtime! Plus, the seat adjusts as baby grows. It can be used from 4 months of age to 40 pounds. When selecting a travel crib, comfort for baby to sleep is obviously key, but there are a few other features we have come to appreciate over the years of travel. Keep an eye out for a lightweight option (15 pounds or less) as well as ease of assembly. Also, we love a crib that can double as a play yard for baby during the day. 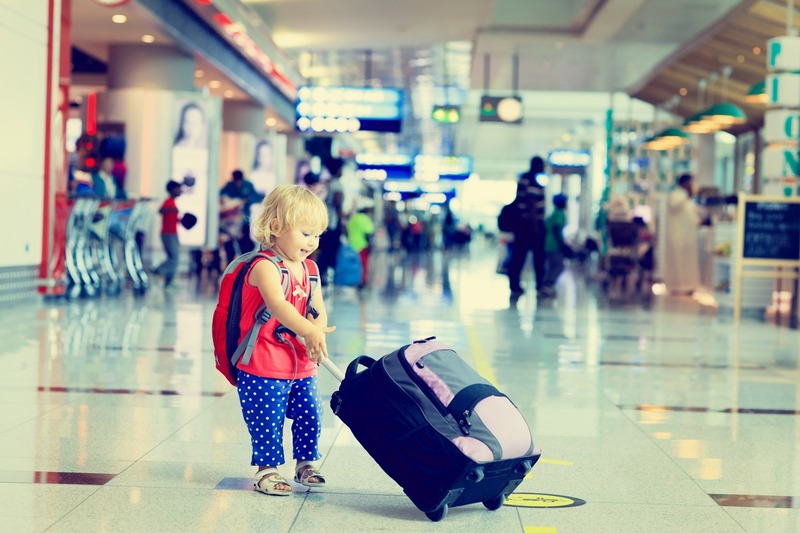 If you plan to travel with a tot who is potty training, you’ll want to be sure to bring their training potty along with them. The Contours Bravo 3-in-1 Potty is perfect. No matter what stage your child is at, the Bravo can convert to work with them. The Bravo starts as a stand-alone potty chair on the floor, then grows to a toilet training seat and a step stool. Having the familiar white noise that baby is used to hearing at home will help them feel more comfortable in their new environment. We use the Homedics white noise machine that has an option to operate on battery power in case we need to soothe baby while on the go. A second fun little tip when it comes to helping baby get the best night’s sleep: we pack a spare blackout curtain and large binder clips to make sure the room is as dark as baby’s is at home. Just clip the curtains over any windows that are letting in too much light! Just like the entertainment, we like to disperse small packs of snacks as needed. And just like the iPad is the last resource, we always have a special snack for desperate moments if needed. We try to avoid any snacks that have too much sugar because a toddler strapped into a car seat on a sugar high is never a good combination. This isn’t a physical item you will pack into a suitcase. However, it is just as important as every item on this list. Mentally prepare yourself for travel and chances are, things will not go perfectly. Someone will get overtired and have a breakdown. There will be a diaper blow-out somewhere along the way. But there are also going to be some amazing memories made over the holidays. We can’t let those hiccups get in the way of this special time of year! So before you hit the road, take a few minutes to remind yourself (and anyone else you are traveling with) to be positive, no matter what the travels send your way! Caroline Simmons is a contributing writer for Contours Baby. You can her motherhood journey and learn more tips from her blog, Swaddles N’ Bottles.